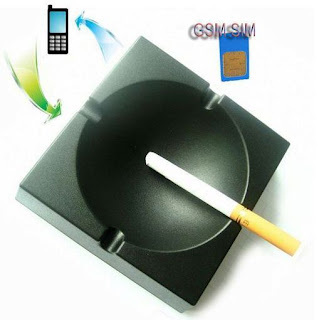 This this ashtray style GSM spy bug has a sound function which can automatically call back. It features clear voice, long standby time, simple operation, stable performance, easy installation and outside control, ect. which can be used distance monitoring, home surveillance and child custody. The GSM audio spy device is like a quadband cellphone without a speaker. You can recharge the spy audio device by connecting the USB charger cable to the power charger. Stand by time: voice control about 3-5 days, 6-15 days without voice control. But it depends on frequency of use. Insert the SIM card into the socket, which opened automatically. The indicator will light 5-8 seconds. After the indicator light put off, close the back cover. It's all. You can used the dialup. Switch out to the B position before you write code. Sending by message GDM (capital) letters + the phone number (such as GDM36201234567) that calls you. This two-way audio spy device comes with a manual switch located next to the SIM card slot. Switching to option (A) only allows you to call the spy audio device and listen in to conversations that are being detected. Option (B) allows the spy audio device to call you when it detects sounds, or if people are talking, while still allowing you the freedom to call the device and listen in to who's talking. Check whether its GSM card, because this machine is used only GSM network. Check the network signal strength when you install (by your mobile).